In this post I shall be sharing step by step how to make fun seasonal cards using the Gelli Arts® printing plates and minimal supplies. For my examples I made some Christmas cards and valentines cards although this could be adapted to any type of card you like. Begin by making some backgrounds. For the deer prints I printed several layers of leaf prints using greens, blues and white. Each of these will give you a main and a ghost print. I then added some detail with sequin waste. You can really make any type of background you like. Experiment and have fun! Do the same for the heart cards. For these I used shades of pinks and yellows and layered using a heart stencil and a swirly stencil. Finally, I made some stamps using craft foam (this has a sticky back to it) attached to a piece of cardboard. I rolled out paint onto my gel plate and used the brayer to transfer the paint onto the stamp. Then stamp onto your background prints, making sure to press down and rub to get an even transfer. To find out more about Lifebook go HERE. It is such an amazing year long course with Tamara Laporte and lots of guest teachers, including myself! Good luck! and I shall announce the winner on Oct 15th! 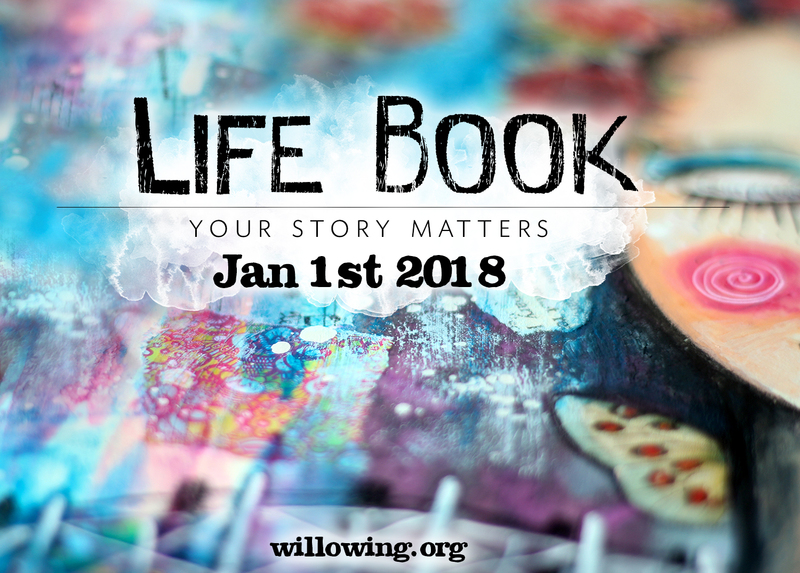 Lifebook opens for registration on the 16th! I’m excited to tell you all that I will be teaching on another collaborative ecourse next year! Art Walk Alchemy 2019 from Mystic Spring Studios on Vimeo. Art Walk Alchemy begins in January and goes on sale today! This is going to be a wonderful, year long, art course with 24 teachers! the focus of the course will be “Totems and Talismans” and we shall be teaching you our own interpretation of this theme through a variety of media. As you’ve already probably guessed, my lesson will involve gel printing of some sort! I am going to focus on hares, as the hare has a special significance for me and Scotland in particular. Hares are mystical, magical creatures here! The 24 lessons (plus several bonus lessons!) will incorporate literal or metaphoric representations in the form of assemblages; journaling; jewelry; masks; watercolor, pastel, and acrylic painting; mono-printing; explosion boxes; collages; spirit dolls; and mixed media. They will be taught by 24 stellar working artists whose art you know and love. This course is suitable for all artistic levels so don’t be shy about joining us. Just now this class is available for the early bird special of just $99! the perfect Christmas gift for a loved one or yourself! Take a look at some of the other teachers that will be taking part. Hope to see you in class! Click Here to sign up using my special affiliate link. This is your way of supporting me as a teacher and is much appreciated! Hello everyone! I am super excited to let you know that I will be guest teaching on Creative Retreat 2018 hosted by Galia Alena! This is a super fun class, the first part of which is a 2 day free weekend online event. This two day online workshop will be jam packed with creative inspiration and lessons with a whole host of teachers! You can also sign up to the ongoing retreat which lasts for 5 months and has a new lesson every week! I will have two lessons in this class, one in the free creative weekend and the second in the ongoing class. Hope to see you in class!! Hey folks! I have some exciting news to share! I am now one of ten Gelli Arts® artist ambassadors! Over the coming months we shall be sharing blog posts (on the Gelli Arts page) and videos on cool exciting gel printing techniques! To celebrate this Gelli Arts® have given me my very own coupon code to share with my followers, if you use this coupon code you get 10% off all purchases over $20. Just use the coupon LucyB to apply it! Can’t wait to share some fun techniques with you all soon! in the meantime check out the Gelli Arts ® YouTube channel and of course my own YouTube channel for lots of gel printing inspiration! I am so excited to announce that I have a brand new Ecourse devoted to all things gelatin monoprinting! The class starts on the 12th of June and is available for the early bird pricing till June 5th!